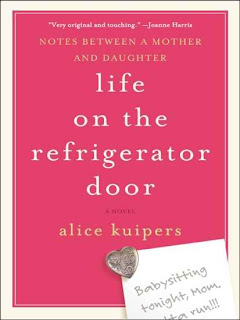 Life on the Refrigerator Door is Alice Kuipers first novel. This brief novel is made up of notes written between fifteen year-old Claire and her mother that are posted to their refrigerator door. With their respective busy lives, the duo rarely see or spend time with each other, so posting brief or lengthy notes is the only way they can communicate effectively (apparently the two haven't caught on to texting or emailing on cell phones although we're in the 21st century, but the idea is certainly endearing). When Claire's mother falls prey to breast cancer, the two females must make the most of their remaining yet hectic time together. Life on the Refrigerator Door seemed so charming when I picked it up; however the synopsis is much warmer than the book actually is. The novel is very depressing and seems to convey that we often allow the smaller things in life (like jobs and money matters) to take precedence over the larger moments that matter the most. This very American way of life continues to anger me; we would rather sacrifice our health and well-being by sleeping less and working ourselves literally to death when we should be enjoying the ride of life rather than focusing on the end result. Concerning the notes on the refrigerator door between mother and daughter, they are generic and basic, and their overall relationship seems to lack in closeness. There were no sad feelings invoked in me throughout my reading of this book; although I was empathetic for their lives being so sad and sorry. Life on the Refrigerator Door may be a perfect pick for victims or survivors of breast cancer, but even then, the book is still depressing. I personally wouldn't recommend it to anyone myself. I'm still curious about Alice Kuiper 's other novels, including Lost For Words (2010) and The Worst Thing She Ever Did (2010), and may eventually decide to pick them up to give the author a second chance.